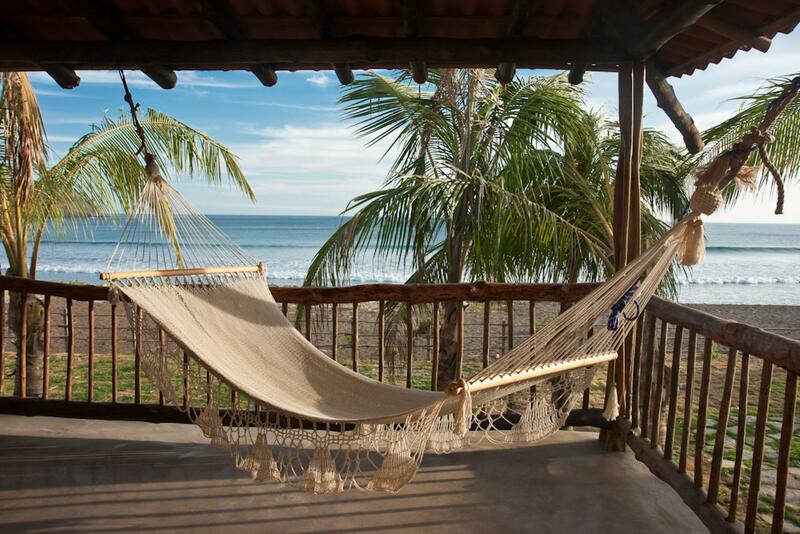 Hotel El Sitio lies along the shores of Playa Venao in the southern Azuero Peninsula. The hotel is friendly, well-kept, and offers comfortable, modern accommodations. Playa Venao is one of Panama’s best surf spots. The beach routinely ushers in long, mellow waves that break both left and right. There are no rocks in the water, which makes Playa Venao perfect for beginners. The beach itself is pleasant, but don’t expect white sand. Besides surfing, there are a number of other activities for visitors to enjoy, including horseback riding, swimming and deep-sea fishing. Hotel El Sitio is set right along the beach, which makes it easy to surf, sunbathe, or simply watch the waves roll in. This two-story hotel has a red-tile roof and modern, spacious rooms. There are fourteen rooms total and many different accommodation options, the largest of which can sleep four people. All rooms feature a private hot water bathroom, air conditioning, and cable TV. They are clean and comfortable, with tile floors and soft lighting. Many of the rooms have private balconies equipped with hammocks and chairs – an ideal place to relax and watch the sun fade over the ocean. The hotel runs a restaurant and bar in a pleasant outdoor rancho. Open from early in the morning until late at night, the restaurant serves fresh food and cold drinks. The menu changes depending on what is in season, but both Panamanian food and international options, as well as locally caught seafood, are consistently on the table. There are both beers and cocktails available, and on Saturday nights the restaurant occasionally hosts music and dancing. El Sitio has a surf shop where guests can rent surfboards or take surf lessons. There is a calm, cool swimming pool that looks out over the ocean, as well as an open-air yoga studio where guests can practice postures or take classes. *Each room has a private hot water bathroom, air conditioning, and cable TV. El Sol/Almendro Suites – these are the hotel’s most spacious oceanfront suites. They have a king-size bed, comfortable seating area, and a large balcony overlooking the ocean. Sunset/Sunrise Suites – These two oceanfront suites have a king-size bed and a balcony overlooking the beach. Oria/Las Palmas Suites – these rooms are on the upper level of the hotel. They have a king-size bed and a partial ocean view. Las Olas/El Moro – these rooms have a queen-size bed and a partial ocean view. Las Brisas/La Marea – these two beach-level rooms have one king-size bed and one single bed. Estrellas/La Luna – these economy, ocean-view rooms are located on the upper level of the hotel. The Estrellas room has one queen-size bed and the La Luna room has two single beds. Arena/La Playa – each of these beach-level units has two rooms. There is a queen-size bed in one room and a bunk bed in the other room. They can sleep four people. "Glad we decided to upgrade to the Las Palmas suite. The room and the view were wonderful. Loved this place and all the staff were special." Glad we decided to upgrade to the Las Palmas suite. The room and the view were wonderful. Loved this place and all the staff were special.